Gives an unique appearance to Barbas with black-grey hair and glowing eyes fitting his not-actually-a-dog-per-se nature. "Skyrim is now host to giant, flying lizards and two-legged cat-men... and you're surprised by me?" 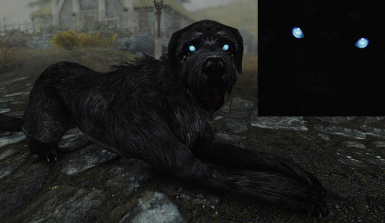 This mod gives an appropiately unique appearance to Barbas, with black-grey hair and glowing eyes fitting his not-actually-a-dog-per-se nature. This look is based on how Barbas appeared on the ESO Summerset Cinematic. The textures are provided in 2k (2048x2048) resolution only. It involves a plugin file (.esp) since he doesn't have unique model in the vanilla game. This pluggin carries over any change done to Barbas by unofficial patches (stealth meter flag) in order to remain compatible and also increases his size by 50% so that he stands out even more among other common dogs.